The weather last Saturday was unbearably hot and I was seeing stars somewhere during our 4-hour session. 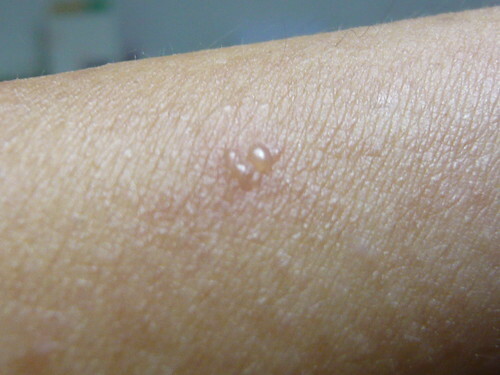 Then next morning, I spotted cluster blisters on my forearms as a result of the sun. Looks like I have to start putting sun screen from now on. Hopefully, the "oiliness" from the sun screen won't cause my racquet to fly off to the opposing court. It happened once but that was due to my racquet snapping off at the handle when I pummeled a big forehand drive. That would have been fine. This would have me malu to death. looks a bit like some kinda ezcema? starmist: No eczema there. But if you look close enough, the whole arm is covered with little blisters. Just that the 3 in the cluster are the only ones big enough to be capture by the digicam.